Okinawa is a prefecture consisting of 160 islands. The　region benefits from a maritime subtropical climate which brings warm winter weather. Many of the islands are increasingly popular as cruise ports for their rich natural environment and unique traditional culture. We, the Okinawa Convention and Visitors Bureau (OCVB), are engaged in the improvement of the major ports (Naha, Ishigaki, Hirara and Motobu) in the prefecture, to ensure passenger safety at the ports. These ports are becoming important departure points for fly & cruise holidays and island hopping cruises. 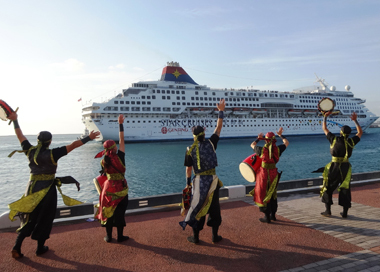 OCVB aims to encourage major domestic and overseas cruise lines to come to Okinawa through its sales promotions with port governing councils and other supporting organisations. Naha Port, situated between Naha city and Urasoe city, faces the East China Sea and plays a substantial role as a hub for maritime transportation. 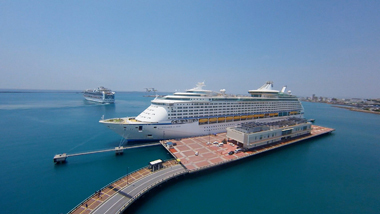 In 2014, a new cruise ship terminal opened to offer greater convenience for overseas tourists arriving at Naha Port. You can reach the city’s most bustling street “Kokusai Dori” and monorail stations via a 10-minute drive from the port. Shurijo Castle is a 20-minute drive away. You can also take high-speed or regular ferries to the surrounding islands from the ‘Tomarin’ terminal which sits within Naha Port. The Kerama Islands national park is accessible from here as well. “Yanbaru”, the northern region of Okinawa Island, contains a wide range of subtropical nature reserves. This forested area has been home to unique ecosystems since antiquity, and is surrounded by seas of crystal-clear water. 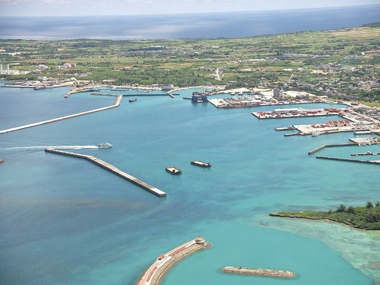 Motobu Port is located in the heart of this pristine region. 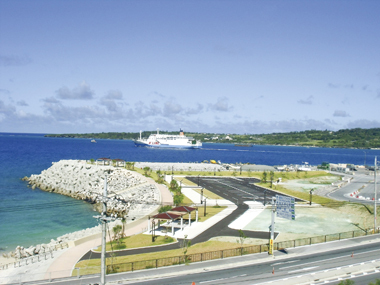 The port gives access to a number of Okinawa’s must-see locations such as the Okinawa Churaumi Aquarium - greeting approximately 2.7 million annual visitors, the Nakijin Castle Ruins - a UNESCO world heritage site, the spectacular ocean views from Kouri Bridge, and the cherry blossoms at Yaedake. The area brims with charm in every season. Hirara Port, located on Miyako Island (Miyakojima) which lies approximately 300 kilometres southwest of Okinawa Island, is a gateway to the city of Miyakojima administering six islands of various sizes. Hirara is the most developed business and entertainment district in Miyakojima. The island is well known for its crystal-clear water, which attracts scuba divers and other water sports lovers. Athletes looking for a greater challenge would be interested in the iron man competition held here each winter. Ishigaki city is located on the southernmost island of the Japanese archipelago. It is the major urban area of the Yaeyama district, where the scattered islands (including Taketomi, Kohama, Iriomote, Hateruma and Yonaguni) are filled with abundant nature and culture. 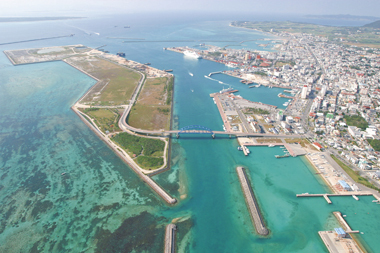 Ishigaki Port is situated near the city centre. Amenities such as public offices, hotels and commercial complexes are within easy walking distance. The bus terminal and car hire agencies are also located in the neighbourhood. The port has plenty of regular high-speed ferry services to the surrounding islands, making it a tourist hub for sightseeing around the Yaeyama district. ©Copyright Okinawa Convention & Visitors Bureau, All rights Reserved.